Manufacturer's IDs: 45057. 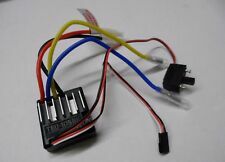 This ESC is especially designed for use with the TBLM series of Tamiya Brushless Motors (Sensored-Type, 10.5T, 12.5T, 14.5T, 16.5T). It is also compatible with brushed motors (Normal Type 540 and Sports-Tuned Motors 25 Turn or higher). Max Continuous Current (FET Spec): Forward 60A, Reverse 60A. 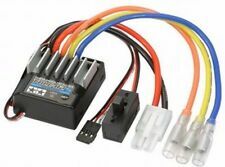 Installing in vehicle and connecting motor and battery. Condition is Used but in as new condition as it was installed but not used to any great extent. Designed for use with the TBLM series of Tamiya Brushless Motors. Removed from a new M06 kit. I have replaced the motor and battery wires as they had tape and joins all over them, it now has new wires new soldered and crimped battery and motor connectors. Tested again after the rewire just to be sure and it works 100%. 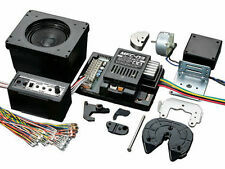 (ITEM 56523) ★ Set MFC - 03 unit, speaker unit, body vibration unit, coupler unit, high brightness LED etc. The sound features the L6 engine, including the air sound, horn sound, etc, 33 types of sounds more than eight types more than the MFC - 01 are loaded as standard. Suitable for brushless (sensored) and brushed motors. TAMIYA throttle TBLE-02S. Virgin taken from Tamiya Kit. Marke Tamiya. Produktserie TEU. Tamiya Spare Parts. Tamiya truck 1:14. Electric motors Brushed. Lubricate and maintain. Colours Tamiya. Marke Tamiya. Produktart Elektro (ESC). Tamiya Spare Parts. Tamiya truck 1:14. DryFluid sliding substance. Colours Tamiya. Marke Tamiya. Acoustic signal, start the engine, idling, parking brake, driving with and without trailers, coupling, uncoupling, shifting into a higher gear, shift into a lower gear, air brake (1), air brake (2), brake bleeding, brake, horn (short ), Horn (long), turn signals (1), turn signals (2), hazard lights, reverse, air release, switching off the engine, notice in deterioration of battery performance. Marke Tamiya. Produktart Motor. Geeignet für Maßstab 1:10. Geeignet für Fahrzeugtyp Autos & Motorräder. 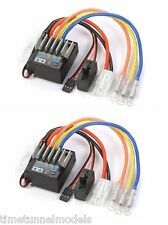 Brushless Motors. Tamiya Spare Parts. Tamiya truck 1:14. Electric motors Brushed. Für Motortyp Brushed und Brushless. 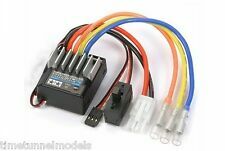 Brushless / Brushed Fahrregler TBLE-02. 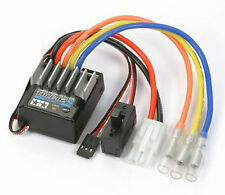 Brushless Motor Limit: 10,5 T. Plug-in system: Tamiya. It is understood only as shown in the pictures. POWER BUNDLE! 15 Turn PRO modified high performance motor. MASSIVE and Comprehensive performance upgrade in one go! Release that nitro POWER! UNLEASH THE POWER. I hope this lot can keep you nitro'd! POWER BUNDLE! 15 Turn PRO modified high performance motor. MASSIVE and Comprehensive performance upgrade in one go! UNLEASH THE POWER. I hope this lot can keep you nitro'd! Release that nitro POWER!